For our collective angst over Australia’s economic decline, wage growth is an indicator most dreadful. Look into the eyes of stagnating wages growth and see property markets crash, governments crumble, and hi-viz-vested citizens burning bankers in the streets. What the people need is a pay rise. The debate about wages tends to split across the employer vs employee divide. The capitalists pigs vs the filthy proletariat. But there are three factors of production: labour, capital and land. The debate about wages overlooks the share of GDP that is flowing to land (and other forms of monopoly rights, such as banking licenses, mining licenses). It overlooks the drag of privatised natural monopolies, and ignores the calcifying effect of market oligopolies (such as in Australia’s gas markets). When GDP is being sucked up in economic rents, it reduces the bargaining power of both labour and capital. By capital we mean investment in competitive enterprise. Enterprise, that along with workers, makes stuff, grows stuff, moves stuff, cares and educates. You know, jobs and growth. In Trickle Up Economics report, we attempted to separate GDP growth by factors of production. At the time we were focused on whether or not company tax cuts would translate to higher wages growth. We felt that the government could do much more for businesses by implementing the Henry Review recommendations. The same is true of wages. We called it the hope of economic growth. As pro-business masthead, the AFR tries to seize the narrative away from an emboldened union movement. A number of past low-key articles have resurfaced – all turning attention to housing (read land). 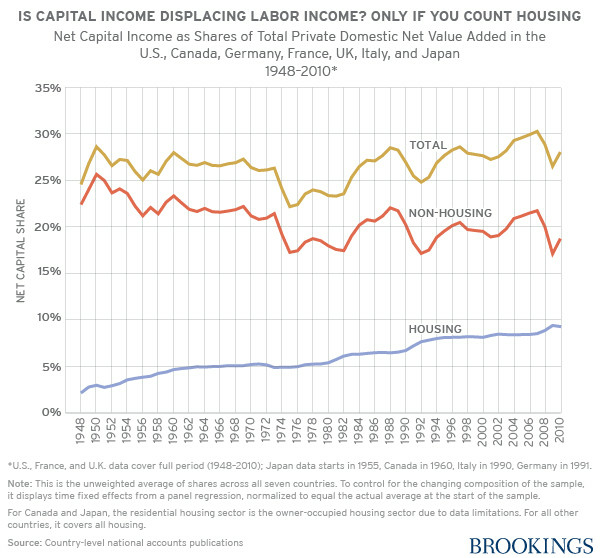 Some may remember Matt Rognlie’s (MIT) dissection of Piketty’s work: Roglinie tested the argument by separating out housing from capital. A very similar analysis was undertaken last year in the Department of Jobs and Small Business. 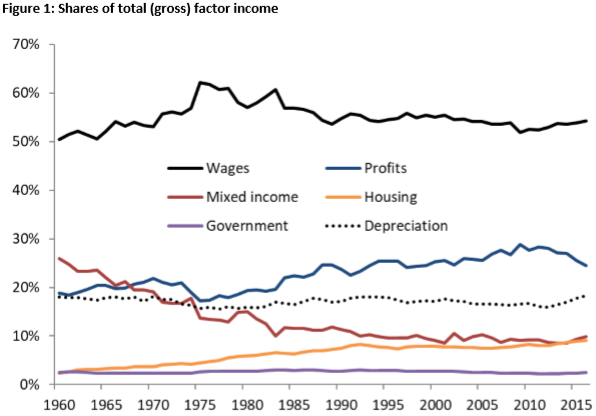 Economists Declan Trott and Leo Vance dis-aggregated housing and depreciation, and demonstrates that the share of GDP to labour and capital has in fact been steady (mining boom resource rents aside, which temporarily contributed to the rising profit share). Their study was narrower in scope due to data limitations and focusing on the corporate sector. A similar conclusion was reached in a paper by University of Sydney economist Stephen Kirchner – the woes of labour need to focus on housing (land) rather than capital. You can read the aforementioned AFR articles here and here (you may hit the paywall). Land price inflation and the growth of rent extracting sectors is working against both workers and enterprise. This is the so-called FIRE (Financial services, Insurance and Real Estate) sector, as well as the extractive industries whose profit share includes significant resource rents. Yet, we could give many people a pay rise and give business a boost by engaging in serious fiscal reform.